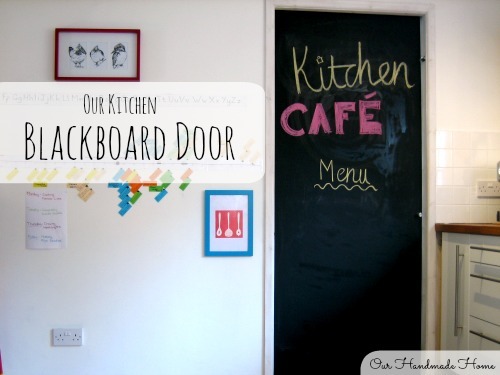 When we began designing our new home (oh so many moons ago) we had written on our wish list for the kitchen 'a blackboard door' and we love how it works for us. The door is between our Kitchen and our Utility room. It is a sliding 'pocket' door (meaning that it slides neatly into the wall), it is an amazing space saver and makes the room more flexible than if it was a normal opening door. It changes all the time, depending who is feeling in an artistic mood. Just now it is our 'Kitchen Cafe Menu' and we take turns writing up what we are eating for meals. 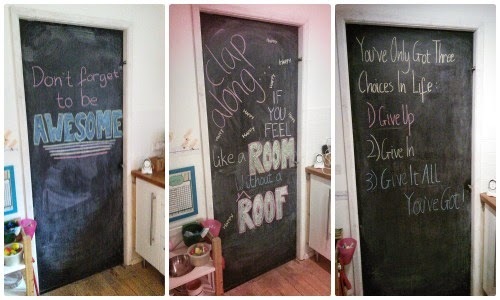 I'd love to try chalk pens but I've heard they don't readily wipe off and need painted over? If you know differently please let me know. The system for hanging a pocket door is sold as a kit (It is pricey and needs installing when you are building the stud wall) I can't remember the brand we used now but if you google 'pocket door kit' you should find them for sale. Blackboard paint is B & Qs own brand - it needs re-painting about every 6 months or so. Our minimalist door handle is a hook from IKEA, it just screws onto the surface and doesn't obstruct the door too much.